October « 2012 « I'd rather be in France. I'd rather be in France. I was sitting in the office (still in the converted barn surrounded by chickens and homegrown vegetables, btw) on Friday when a former coworkers stopped by to pick up his coffee bean grinder. Now our only option for freshly ground beans is a manual grinder with a crank that takes a solid five minutes to grind enough coffee to fill one tiny K-cup filter. Wah, life is hard. This former coworker struck up a conversation about food, a frequent topic of discussion when we worked together, and he ended up telling me about a couple of bowls of French onion soup he recently had in Monterey. As soon as he said the words “French onion soup,” I knew what I was having for dinner that night. I stopped at the grocery store on the way home and ambitiously bought twice as many onions as I ended up needing, and spent the rest of the evening slowly caramelizing (half of) them and turning them into a large pot of sweet and salty French onion soup. Making French onions isn’t complicated, but it does take a bit of time and vigilance. I am beginning to see that starting a business is, in some ways, very similar. You see, there is a lot of detail work in the beginning, thinly slicing a pound and a half of onions that will probably leave you in tears at some point (and cursing in vain at the onions for their particularly gaseous quality). Then there are the multiple stages involved, each of which is very important to the end product. I followed Julia Child’s recipe for Soupe à l’Oignon Gratinée from Mastering the Art of French Cooking, which you can find here. You start by heating oil and butter and then cook the onions on low heat with the lid on for 15 minutes. Fifteen minutes doesn’t seem like a very long time and you may want to keep them in a little longer, but you can’t. It’s time to take the lid of and present your lightly cooked onions to the rest of the kitchen. Some people around might not like onions, and they may take one look at your pot still brimming with bright white onions and turn up their nose. You just have to shake it off and keep moving forward. You are making French onion soup, and it is going to be delicious. This might be a good time to pour yourself a glass of wine. One of my favorite wineries at the moment is Little Vineyards in Sonoma, California. They produce some pretty tasty Syrah and Zinfandel with a lot of character, no oak, and just the right level of dryness. If you are in the Sonoma area, you should visit them. If you are in the Santa Cruz area, you should come to my house and have a glass with me. Anyway, back to our French onions. At this point, you have to turn up the heat. You’ll add some unexpected ingredients, like sugar, and then spend the next 40 minutes painstakingly watching and stirring the onions while you wonder if they are ever going to turn the proper shade of golden brown. Your focus might lapse for a few minute and you may find a onion sliver or too has skipped the stage of caramelization and gone straight to burnt, but don’t let this get you down. Just remove the offending sliver, turn down the heat ever so slightly, and remember to stir more frequently. Then the moment comes and you realize your once full pot of onions has been reduced to a concentrated layer of rich and fragrant caramelized onions. You look down on them with satisfaction. Success. But wait, its not over yet. You have to remove the onions from the heat, stir in flour, and pour in boiling stock (hopefully you planned ahead and had it ready). Mrs. Child says to add two quarts of stock, but I find this dilutes the soup too much, so I recommend cutting the stock by 25% or starting off with more onions. At this point you might realize you don’t have everything you need after all, such as a bay leaf, but you improvise and make it work anyway. Now its time to wait. Again. Things are kind of on autopilot now, so you don’t have to make as many trips to the kitchen. The aroma filling your apartment lets you know the end is in sight, and it is time to gather your remaining ingredients. 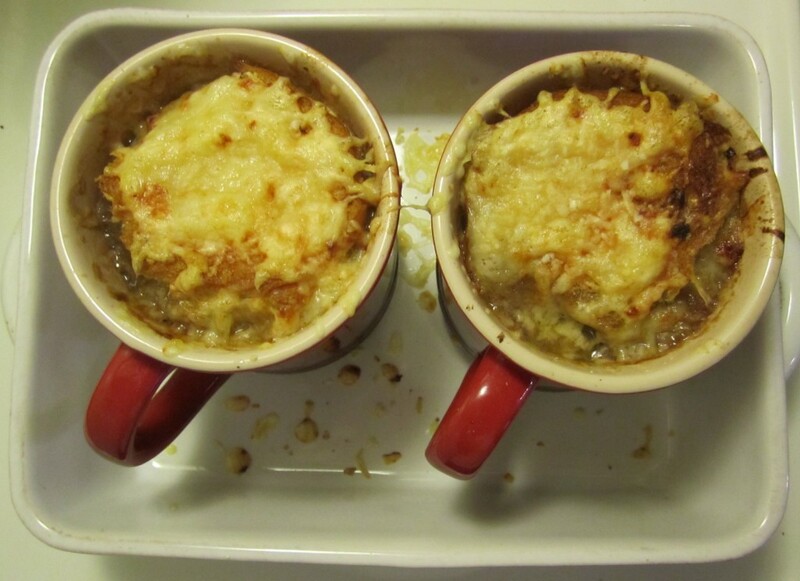 After all you aren’t just making French onion soup. You are making it gratinée. I recommend adding more shredded cheese than I did. 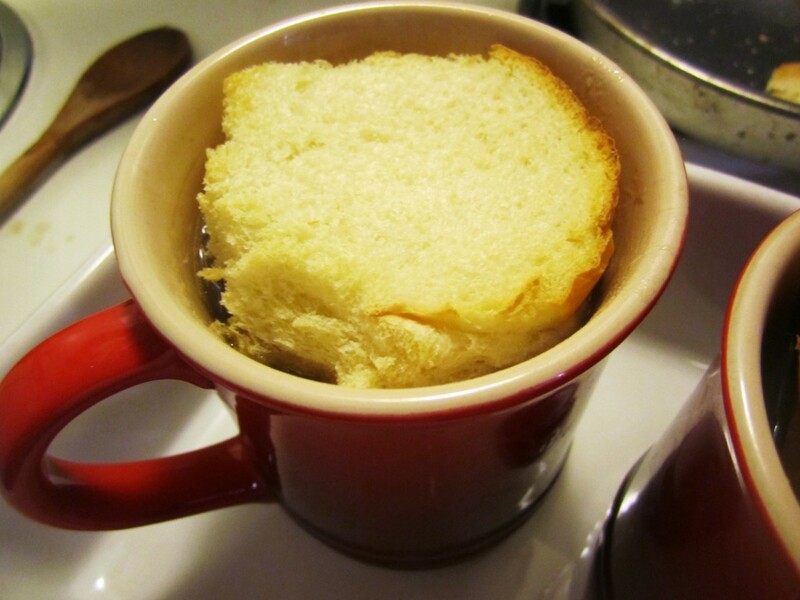 The cheese should completely cover the bread and, for the sake of aesthetics, extend to the sides of the bowl or cup. 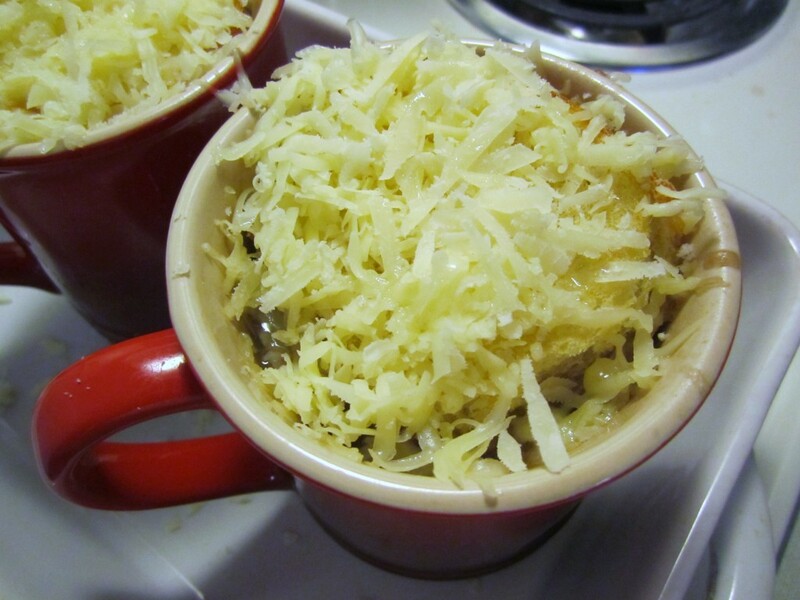 You’ll want to add the grated onion and a few slivers of cheese directly into the pot of soup before you divide it up. For bread, I picked up a bag of dinner rolls from my local grocery store’s bakery section and cut them in half horizontally before toasting them cut side up. I like the texture of the dinner roll more than french bread because it is easier to cut with your spoon as you eat your soup. 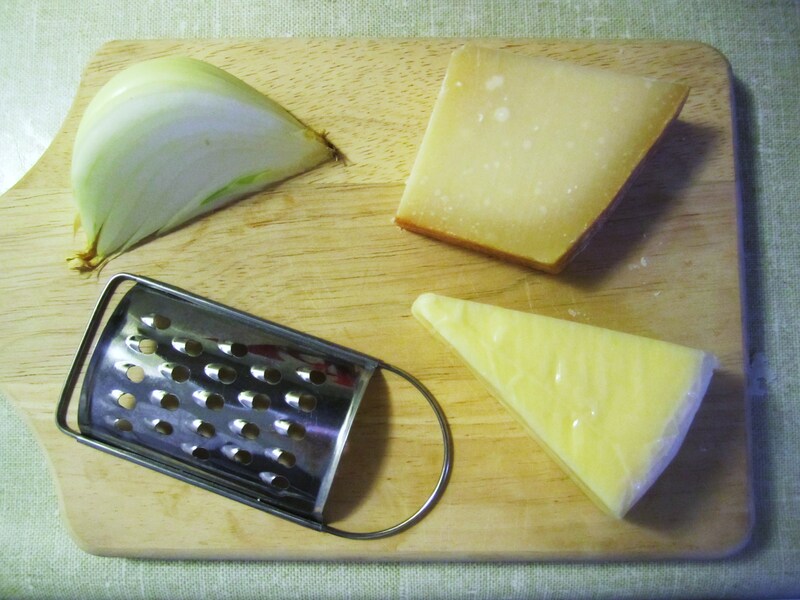 By now, your onion soup is made, the gratinée is added, and all that is left to do is pop the individual portions into the oven for 20 minutes (you didn’t think you were going to be eating any time soon, did you?). At the end of the 20 minutes, if the cheese isn’t as toasted as you would like, turn on the broiler for a minute or two. 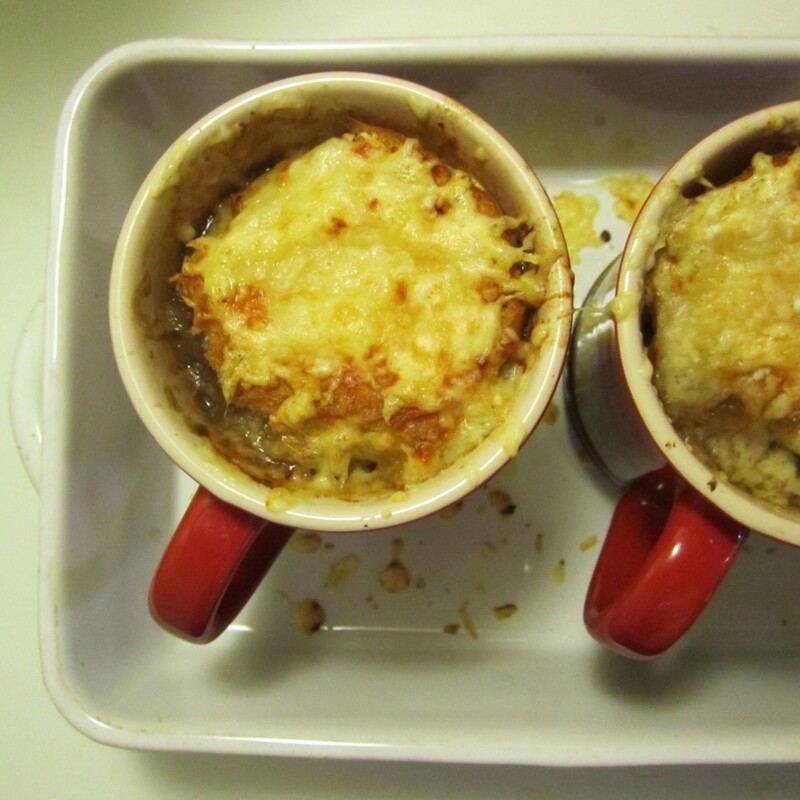 Now take a sip of wine (if there is any left) and pat yourself on the back, because you just made French onion soup that will rival any restaurant you’ll ever go to. But then I thought, who am I kidding? 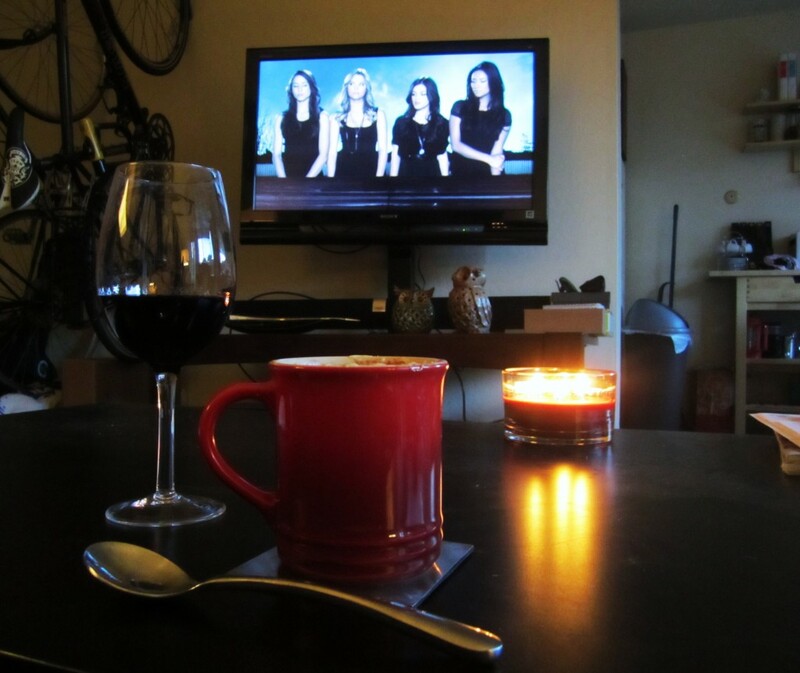 I might as well admit that I enjoyed my cup of soup siting on the sofa watching an episode of Pretty Little Liars. I can’t say what it’ll be like to finally have this business up and running (you know, the one I’ve only vaguely referenced and won’t tell you anything about), because it is still just the beginning. I can say that there is a long and detailed road ahead of Arthur and I, and like the soup, it’ll probably definitely involve tears and cursing. We are just a week or two away from incorporating the business and registering our trademark, so I’ll start dishing the details very soon. Thanks for joining me on this journey. No spam, I promise, only the occasional email from me alerting you of more photos of roasted chicken.